The history of brickwork in Toronto is vast, with some incredibly old buildings still standing in proof today. Toronto has no dry season, it rains and snows and temperatures are known to fluctuate throughout the year between 20 degrees F and 81+ degrees F (on average). In 1750, the first European settlement near modern day Toronto sprung up as a French trading fort known as Fort Rouillé. Yet, long before European settlement began a number of native peoples called this land home. The first major influx of Europeans coming to Canada was sparked after United Empire Loyalists fled the U.S. during and after the American Revolution. By 1793, Toronto was officially known as ‘York,’ and named the capital of the new colony of Upper Canada. It wasn’t until 1834 that Toronto became known by its modern day name. Throughout the nineteenth century Toronto continued to grow, surpassing Montreal to become the largest city in Canada, as well as the economic capital of the country. What every leading city needs is strong infrastructure, something Toronto is known for. Toronto’s oldest buildings are fascinating and full of history, some are log cabins and others are brick masterpieces. Looking around Toronto it is easy to see how much things have changed over the years, as old buildings stand tall beside newer or more updated construction. Miss-matched houses and businesses highlight architectural and brickwork changes over the years. Some people have chosen to update their homes in ways that pay tribute to modern heritage, while other homes are going for a more modern appeal, ditching all signs of the past. Ornate brickwork in Toronto such as ‘flared lintels,’ gently curved archways located above windows and doors, have become more popular over the years, as well as mansard roofs with decorative slate shingles. While brickwork and overall construction design has changed considerably since the early days, it also remains largely the same. Since we are focusing on the history of brickwork in Toronto here is a look at a couple of the oldest brick buildings still standing today. The Campbell House: The beautiful brick house located in downtown Toronto was built by Chief Justice Sir William Campbell and his wife Hannah back in 1822. At the time the large home was built the family’s children had already grown up and become adults, and the Campbell’s were well established enough to afford such a grand home. The house is built in traditional Georgian era style using what is known as Palladian architecture. The Campbell house was used as a private residence until 1890 when it was turned into an industrial warehouse for several businesses. Interestingly, the house once sat nearly an entire mile from where it is today. The move was a big event with Her Majesty Queen Elizabeth, the Queen Mother opening the restored and relocated structure on April 1, 1972. Today you can still visit this incredible piece of history. It is used as a clubhouse for the Advocates Society and is also a historic home museum open for tours. The Grange: The Grange home is another example of Georgian style architecture. It stands as the oldest brick house and the 12th oldest surviving building in all of Toronto. The Grange was built in 1817 for prominent society member D’Arcy Boulton. A few generations of the Boulton family called the place home until 1910 when it was donated to the Art Museum of Toronto, which is known today as the Art Gallery of Ontario. Today, the original house has been added onto several times. All restorations and additions have been carefully applied as to keep the original aspects of the home in place. The Grange was designated a National Historic Site in Canada in 1970. Due to the extensive history of these brick buildings it is clear why brickwork in Toronto has remained a popular choice throughout the years. 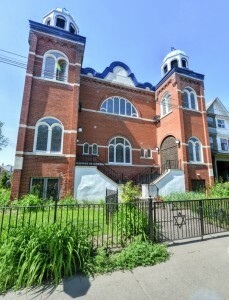 Turnbull masonry are experts when it comes to historic restoration in Toronto. Turnbull Masonry is dedicated to providing the highest quality brickwork in all of Toronto. We build and restore masonry projects to last a lifetime.